“What is this mom?” asked my seven year old girl astonished to see a purle - pink parantha on her plate. She sniffed, she smelt, she inspected and took a very small bite reluctantly more to find a reason for not eating it. “ummmmm …..hmmmmm……chomp, chomp, chomp … wow! Tastes good. Can you keep it in my lunch box?” Yes! Mission accomplished. Getting children to eat healthy things at times becomes really challenging. Generally a non fussy eater, my daughter has been showing a dislike towards proper meals and is ever willing to have bread, stuffed aaloo paranthas, pasta and noodles. I wanted my kids to have beets. After failing to convince them to have BEET YOGURT DIP (BEET ROOT RAITA), I wanted to incorporate beets in food in other ways. 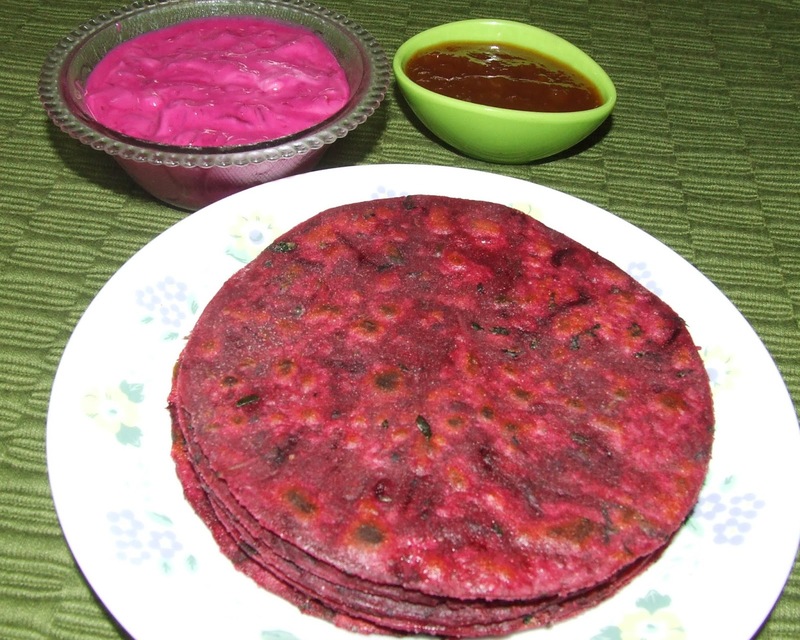 And thus, Beet Paranthas were invented. While she was enjoying the paranthas I told her that beets will turn her cheeks red. This is what out dad used to tell us to make us eat slices of boiled beets with our food. 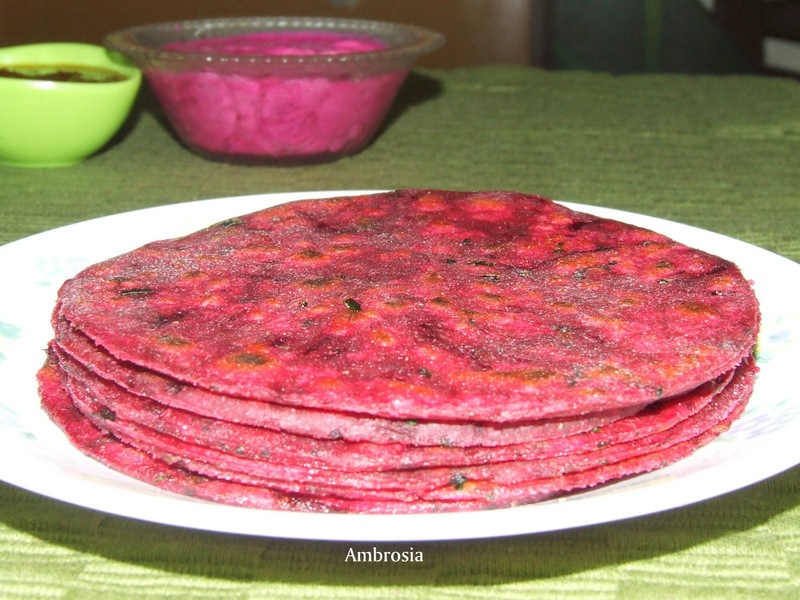 Beet root Parantha has lovely colour of the beets and great flavour imparted by fenugreek and bishop’s seeds (ajwain). 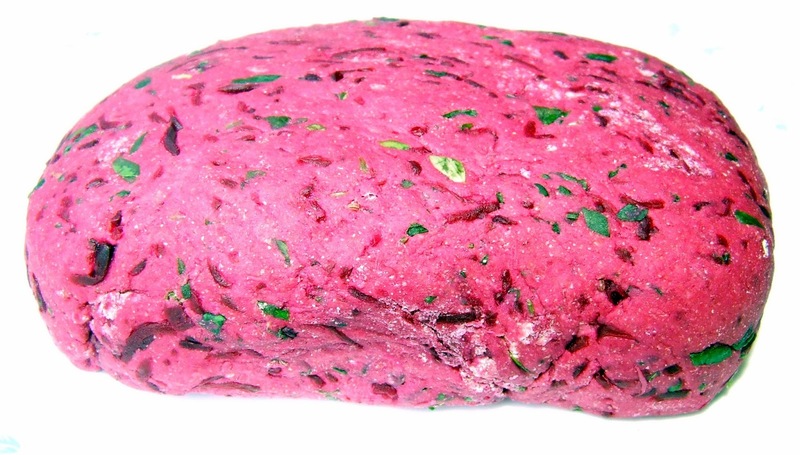 Pressure cook beet root till just tender. When cold, peel and grate. Add grated beet root, chopped fenugreek leaves, bishop’s seeds (ajwain) and salt to the flour. Mix well. Using warm water, knead soft dough. Cover and let it rest for at least half an hour. To make paranthas, take a ball of dough, flatten between palms and using dry flour roll out a parantha. Cook the parantha on a hot griddle. When golden specs begin to appear on the underside, apply oil and cook till parantha becomes golden. Repeat on the other side. I would love to eat them if they turn my cheeks pink too!! :):) Loved the fact that your little girl adored these healthy paranthas. You are like a little window into a dream world on the other side of the globe where color, flavor, and harmony seem to roll right up into one. Beautiful! Love your blog and recipe ideas and that you put beets in everything. My wife and friends all appreciate you too even though they never read the blog, they just eat everything I make them. I love how your recipes put beets in everything. It is a wonderful root and I enjoy everything it touches.